It’s been a long time coming and the time is night! New Alliance North is Officially available for rental as an authentic creative space for making electronic music. What makes New Alliance North special is a focus on real time music creation. It’s a place to bring your laptop and record in a way that is free from the DAW that lurks within the screen. New Alliance North! Synth studio! All machines in the studio are synced via a master tempo clock in the analog domain with a Roland XBS 80. This box allows all devices to be in sync and play in real time together. Even better is that you can stop and play and device independently of the others! Want the TR808 to be one half measure late to create a new rhythm? Hit play whenever you want! Another great performance device is Garfield Electronics Mini-doc. There’s a few of these wired up for mapping arpeggiator clock to any synth that can see it! Drum Machines: For drum programming we offer all variants of technology and heritage. Samplers. Kurzweil K2000S, Ensoniq Mirage sampler, Emu Emax II, Oberheim DPX-1 sample player ( tons of Eii, Ensoniq, and other sound disks ). There’s more available upon request! Recording Hardware. For recording we currently have 18 I/O via firewire 44k-96k compatible! This will soon to be expanded 32 channels via thunderbolt. It has been a productive week! Often when i clean my house i put on a record to add some groove to the mundane. Several of the Big Audio Dynamite records are in heavy rotation. They are infectious, fun, uplifted, and groovy! Another day another Linndrum article! “What are they? The first drum machines to feature digital sampling. Before the release of Linn’s LM-1 Drum Computer in 1980, early drum machines could only synthesise drum sounds out of bursts of white noise or sine waves. The LM-1 and Oberheim’s DMX sampled actual drum hits, which could be programmed and manipulated with lovely knobs. Who uses them? The LM-1 was elite gear. Only 525 machines were ever made, and inventor Roger Linn managed to flog them by dragging around a little cardboard-box prototype to showbiz parties. Notching up pre-orders with Peter Gabriel, Fleetwood Mac and Stevie Wonder, the Drum Computer became a bourgeois must-have object, and was quickly put to use in hit records from the Human League, Gary Numan, and, most notably, Prince. The DMX, released a year later, became synonymous with booming hip-hop: producer Davy DMX loved the machine so much he not only named himself after it (along with DMX Krew and, of course, DMX), but he built Run DMC‘s whole sound around it. Check out these Spotify playlists for the DMX and the LM-1. How do they work? The Linn stored twelve 8-bit samples, which could be individually tuned: kick, snare, hi-hat, cabassa, tambourine, two toms, two congas, cowbell, clave and handclap (but no cymbals!). The DMX boasted 24 drum sounds and a bunch of pseudo-humanising gimmicks such as rolls and “flams“, as well as a pre-MIDI synchronisation doohicky. Where do they come from? These machines were a huge leap on from the first stand-alone drum machine, the PAiA Programmable Drum Set, which was sold in 1975 as a build-your-own kit. Roger Linn credits Toto drummer Steve Pocaro as the man who first suggested the brainwave of sampling real drums on to a computer chip. Why are they classic? The DMX and LM-1 established drum machines as credible, powerful instruments – previously they had been dismissed as toys. In keeping with the Movement CMS Drum Computer post i did, here’s a full blown book about all the special drum machines that have been! I can’t pass up the chance to share this hilarity. I’ve seen this Roland TR 909 come up on Ebay in the past and now it’s popped up on Craigslist in Denver. I wanted to memorialize it in all it’s glory before it’s gone for ever! Be sure to check out the gallery. It’s just crazy. The TR 909 looks like it was brought into a burning house to play a DJ set by the fire department! 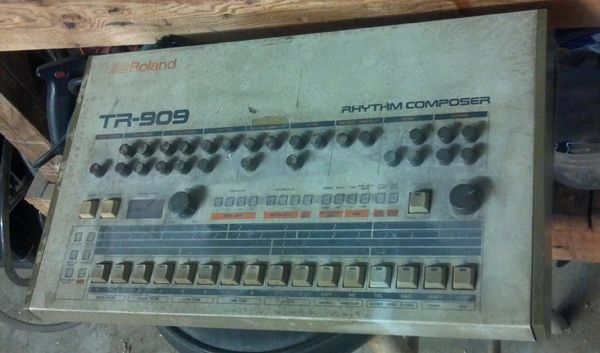 Roland TR-909 Drum Machine… Original owner. Bought it new in late 80’s. First $1500 buys it. Everything works, but tarnished from being stored in a studio that was heated with wood stove.Totally clean in the inside other than very little dust.When I plug in with speaker… all seems to work. All instruments sound perfect and work, including the loud and soft keys. I didn’t notice any scratchy sound on knobs other than when the main volume is turned almost all the way down. I think minor cleaning would solve that.Now… I bought this new in the Mid 80’s… they JUST came out when I bought it. I played around with the programming of it, and I either am not remembering how to clear written programs, or it might have a internal battery that needs replacing. Or, maybe it has issues. My point is that I know everything works, but I don’t know 100% if the programing memory thing works. Probably does, but I don’t have time to re-learn this unit. It’s not supper use friendly. Will sell this as is for $1500. Cash only… no pay pal.NOTE: I personally think an old item like this is better viewed in person. No returns, sale is final, so you get what you get. Cash and carry, no shipping offered.